We are one of the best organizations in the market, involved in offering a wide collection of Designer Wall Clocks to the customers. These products are made from high quality components at very reasonable prices. 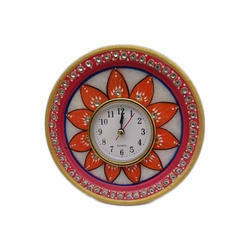 Clock Dia:-12", Full Dia;-18", Wide:-3"
One Beautiful Round Wall Clock to decor your home from InterioCrafts. Thank you for shopping at InterioCrafts. Happy children playing in the park make for an ideal wall clock for the kid’s room. Bright yellow color add to the charm. Distress finish on the surface add to the vintage look. - Size: 6 inch, 8 inch, 10 inch, 12 inch, etc. Decorative wall clocks are made from sustainably produced MDF with the design digitally printed directly on the MDF. It won't fade or warp. Under the meticulous supervision of our highly skilled professionals, we are providing high quality range of Vintage Wall Clock. 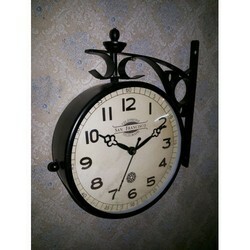 Adorn your living room decor with the appealing designs of this wall clock from Vintage Clocks. This wall clock features vintage style Roman numerals and measures 30x30 cm. Made from wood, this clock weighing just 500gms can be easily installed and maintained. This single wall clock with its high-quality design and material can also be used as a gift for your friends and relatives.